One of the best European players over the last decade, Hristo Stoitchkov, began his professional career with CSKA Sofia where his talent and temper soon caught the eyes of many scouts. Because of his pace and quick movements, Hritso was a player who was difficult to mark which left most defenders behind when he had his sight on goal. Hristo won the Golden Boot, awarded to the top scorer in Europe, after scoring 38 goals in his last season at CSKA. That would signal the end of his playing days in Bulgaria and left to join the "Dream Team" of Barcelona in the summer of 1990. He lived up to his reputation as a lethal striker and a trouble-maker as well during his first season at Barcelona. He was suspended for weeks after he stamped on a referee's foot on purpose, but still came through and delivered the goods when he was on the pitch. 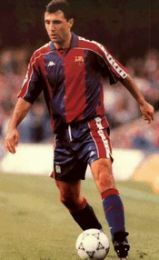 During his stay at Barcelona, Stoichkov had won four straight league championships and a European Cup. 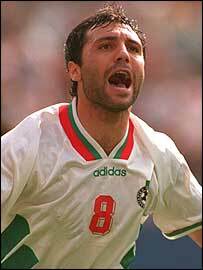 Hristo played in his first big tournament for Bulgaria in the 1994 World Cup, and against all odds, Bulgaria reached the semifinals. He showed that he deserved to be recognized as one of the world’s best players after scoring 6 goals and shared the topscorer title with Oleg Salenko. He scored memorable goals along the way but most will remember him for his well executed free kick against the Germans in the quarterfinal which leveled the scoreline for Bulgaria and ended up knocking-out the defending champions. Bulgaria would lose to Italy in the semi-finals and then to Sweden in the 3rd-4th place game. After returning from World Cup 1994, he had a short unhappy spell with Parma before returning to Barcelona for another couple of years but was used sparringly by Van Gaal. He was included in the Bulgarian squad for the World Cup in France at the age of 32, but neither he nor the team could produce their magical form of four years earlier. Stoitchkov would then go on and play in the MLS for the Chicago Fire and DC United before retiring and was a youth coach for Barcelona before Euro 2004. He was the head coach of the Bulgarian national team after EURO 2004 concluded but it was short lasted and then had a short run as the coach of Celta Vigo too.